Hall of Fame trainer Roger Attfield will have two shots at taking Sunday’s $175,000 Sky Classic Stakes (Grade 2) at Woodbine with the streaking graded stakes winner Tiz a Slam and former Breeders’ Stakes champion Danish Dynaformer headlining a field of six set to face off in the 1-3/8 mile turf event. Chiefswood Stable’s big, long-striding homebred Tiz a Slam has matured into a multiple graded stakes winner and enters the Sky Classic off back-to-back victories in the Grade 3 Dominion Day over 1-1/4 miles on the Tapeta and the Grade 2 Nijinsky over 1-1/2 miles on the E.P. Taylor Turf Course. The four-year-old Tiznow-Flaming Rose colt was an upset winner at double-digit odds in both events, scoring in front-end fashion in rein to Steve Bahen. “He’s just developed, and now he’s four and getting close to maturity now,” said Attfield of the career winner of six races and more than $845,000 from 18 starts. “He’s just grown into a nice big, strong horse and he’s come into himself very well. Tiz a Slam worked five furlongs in 1:00.60 handily on August 12 over the all-weather track with stablemate Danish Dynaformer, who is approaching the million-dollar mark in earnings. Owned and bred by Charles Fipke, the six-year-old son of Dynaformer out of Danish Wildcat finished sixth in his most recent stakes on June 23 in the Grade 3 Singspiel, a 1-1/2 mile turf race he proved best in two years prior. One of Danish Dynaformer’s other career highlights was winning the Breeders’ Stakes and with that race coming up this weekend, Attfield reflected on his trainee’s 7-3/4 length triumph in the 2015 edition. “He was training so well at that point in time,” recalled Attfield. “I’ve always thought that he was a Group 1 horse, but just haven’t been ever able to prove it and then we’ve had a few little things going on, so it’s been a little bit difficult, but he’s a very, very talented horse when he’s right. With a risk of thunderstorms in the forecast heading into the weekend, Attfield is hoping for a firm track for both of his contenders. “Right at this moment in time, we’re going in there with two horses that we feel are in really good shape,” said the five-time winner of the Sky Classic Stakes, who took back-to-back editions recently in 2012 and 2013 with Forte Dei Marmi. Graham Motion, who has trained the last two Sky Classic winners (Messi and Can’thelpbelieving), will send out Woodbine newcomer Utmost in this year’s event. Owned by Augustin Stable, the four-year-old Giant’s Causeway-Fugitive Angel colt finished a game third in his North American debut in the Cape Henlopen Stakes on July 7 over 1-1/2 miles on the turf at Delaware Park. Zilli Racing Stables’ Seeking Albert, who ran fourth in last year’s Breeders’ Stakes as well as the Grade 1 Northern Dancer Turf Stakes for trainer Michael De Paulo, will be looking to breakthrough for a graded win after finishing fifth behind Tiz a Slam in the Nijinsky. Black Sea, who also finished fifth behind Tiz a Slam when competing in the Dominion Day, is another contender. The French-bred five-year-old joined the Nicholas Gonzalez stable after being claimed for $50,000 this past winter at Gulfstream Park by Lucio Tucci and Martha Gonzalez. 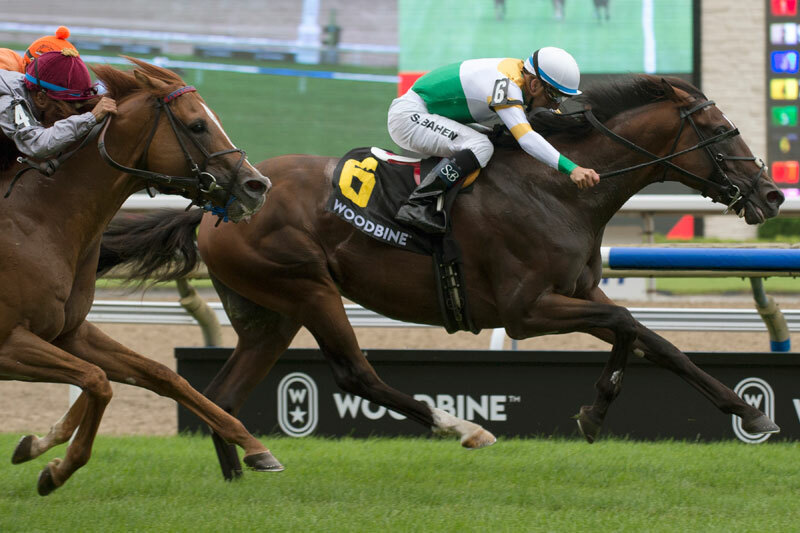 The field also includes the Ian Black-trained Drumcliff, who will be stepping up into graded stakes competition off his first turf win over 1-1/8 miles on July 7 at Woodbine for trainer Ian Black and owner/breeder Joan Addison. Here is a look at the complete field in post position order for this year’s edition of the race named for the Hall of Fame titan of the turf Sky Classic. First race post time for Sunday’s 11-race card is 1 p.m., with the Sky Classic Stakes scheduled as the ninth race.